Our thanks to Alejandro Ramon from Zingerman's Bakehouse in Ann Arbor, Michigan, for sharing with us the recipe for this deep-dark, dense, moist, supremely chocolate-y cake. Not only is it flourless — it's gluten-free, making it perfect for any audience. 5 hrs to 14 hrs 10 mins. *Omit the salt if you use salted butter or margarine. Preheat the oven to 350°F. Boil a kettle of water; you'll need it for a water bath. Spray or butter a 9" round cake pan. Place a parchment circle on the bottom of the pan, and grease the parchment. 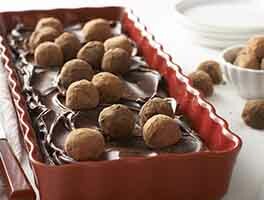 Chop the chocolate and dice the butter or margarine into 1/4" pieces, and place them in a mixing bowl. Pour the water into a saucepan, add the sugar and salt, and bring to a boil, stirring occasionally to be sure the sugar dissolves. Remove the sugar water from the heat, and pour it over the chocolate and butter. Stir until the mixture is completely melted, smooth, and shiny. Let it cool for 10 minutes before adding the eggs, so they don't cook. Whisk the eggs with a fork until well blended. This doesn't mean beat the eggs; just be sure they're of a uniform consistency. If you're adding liqueur, stir it in once the eggs are blended. Add the eggs to the chocolate mixture and blend well. Again, no beating is required. 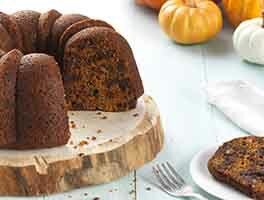 This cake is meant to be moist and dense, so you don't really want to introduce a lot of air bubbles. Pour the mixture into the prepared pan. Place the cake pan in a large, deep baking pan that's already set on the oven rack. Slowly pour the boiling water into the deep pan, to bring it halfway up the side of the cake pan. Carefully slide the rack back into the oven, trying not to splash water into the cake (although it won't ruin the cake if you splash in a drop or two of water). Bake the cake for 45 to 50 minutes, and remove it from the oven. The center should feel set when you touch it, and the edges will just barely be starting to pull away from the sides of the pan. Carefully remove the cake from the hot water. Allow it to cool at room temperature for 1 hour, then cover it with plastic wrap and refrigerate for at least 3 hours, or overnight. Once the cake is thoroughly chilled, remove it from the pan. Run a knife or offset spatula around the edge of the pan. Set the pan over a low flame or burner on the stove for 30 seconds. Lift the pan with oven mitts and place a cutting board covered with parchment paper over the top. Flip the cake over, so the parchment and cutting board are underneath. Tap the edge of the pan sharply on one side, turn it 180°, and tap the pan again. The cake should release. If it doesn't, tap it a few more times. When you feel the cake release, flip the cake and pan back to an upright position, using the parchment and cutting board to prevent the cake from falling out. Place a serving plate on top of the cake pan, and carefully flip everything over. Lift up the pan — the cake should remain on the plate. Peel off the parchment. Refrigerate the cake, uncovered, for 15 minutes, to allow the top to firm before cutting. To finish and serve, cut the cake into at least 16 pieces — it's very rich. To prevent sticking, use a sharp knife, dipped in hot water and wiped off after each slice. Dust the top of the cake with cocoa powder. Serve with fresh raspberries, if desired. This cake will keep well in the refrigerator for up to four days; for longer storage, wrap well and freeze. To serve, simply defrost overnight in the refrigerator. Yield: 1 cake, 16 to 20 servings. This cake makes a wonderful Passover dessert. While our chocolates are kosher, they're not pareve or kosher for Passover. And if you have severe nut allergies, it's important to note that they're not produced in a nut-free facility. We love Belcolade or Guittard bittersweet chocolate in this recipe, but use chocolate of whatever degree of bitterness you prefer. 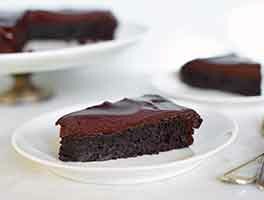 You can also substitute up to 20% unsweetened chocolate, if you prefer a darker, less sweet cake. If you're making this cake dairy-free for Passover, use margarine instead of butter. But beware — many margarines contain salt; so if you use salted margarine, omit the salt in the recipe. Made this one for Passover 2016 in addition to the other flourless chocolate cake on this site. I used KA vanilla extract instead of liqueur and I used mid-price bittersweet chocolate bits and both worked fine. One lesson learned: It was my first time incorporating eggs into a hot mixture and even though I let it sit and cool 10 minutes as noted in the recipe, I got a few egg threads (think egg drop soup). Next time I will increase the cooling time. The threads were barely noticeable and certainly didn't stop anyone from eating it! My coworkers and I are evenly split on which of the flourless chocolate cakes is better. This one seems to be "classier" and more like something from a bakery, probably due to the truffle texture. This cake was the hit of a recent dinner party. Everyone raved about it! It was easy to prepare and turned out exactly like the pictured cake. The only change I made to the recipe was adding 1 tsp of Vanilla Plus instead of liqueur. Yum! I recommend cutting the cake before serving. This cake is so easy to make! I made it several days early, following the directions on the blog. I carefully wrapped it in plastic wrap and a freezer bag and stored it in the freezer for 4 days. After thawing in the refrigerator for several hours, it was easy to slice with a very sharp knife. (I did follow the directions-dipping the knife in warm water and cleaning it between slices.) It was also much easier to serve already sliced. I served it with a few teaspoons of raspberry puree on each plate and topped with whipped cream and a few fresh raspberries. I'll definitely be making this again and again!! I have made 3 of these and recommend them. First go, following the directions, was perfect. Cocky on the second try, a double batch, I tried to use my food processor to mix the eggs and brandy and although I only pulsed the eggs, it introduced air. The cakes rose more and dried out a bit on top. SO, I recommend using a food processor to really really powder the chocolate before dumping it into the bowl with the butter for melting. Only use a hand mix to break up the eggs before blending in the optional ethanol. And the batter in the 9 inch pans was almost to the top, making it difficult to get into the roasting pans even before adding the boiling water. My guests at yesterday's Seder didn't know about the slightly over done tops of the air introduced cakes because, hey, I didn't tell them! And the tops were on the bottom, anyhow. Loved this with raw raspberries, as shown. Use great chocolate (I used Wilbur's bittersweet brandywine), barely wisk the eggs and follow the chilling, bottom heating for unmolding and serving directions exactly. 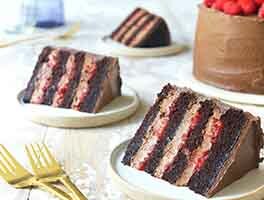 Makes a beautiful cake but it is more like a very rich mousse than a cake. Even chilled it had the texture of a truffle. My guests only wanted a bite or two. Would have been better with a mixture of bittersweet and semi sweet chocolate and perhaps some ground nuts. 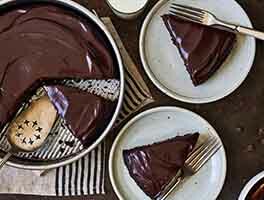 My daughter and I have been on a quest to find the perfect flourless chocolate cake and this one is it! 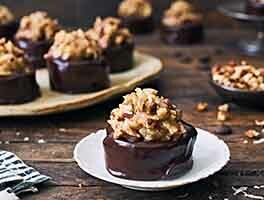 Dense and full of chocolate flavor, it's the answer to us who avoid gluten. This one is a definite keeper! My family has already asked for it again. Absolutely fabulous! It's definitely pricey to make but so worth it for a special occasion. I used fairly good, fair trade organic 85% cocoa chocolate with 2 oz of unsweetened chocolate. I added about a teaspoon of vanilla, just because. And I used duck eggs (4 very large) instead of chicken eggs. My husband couldn't stop raving about it. I'd recommend a bit of unsweetened (or lightly sweetened) whipped cream on top.